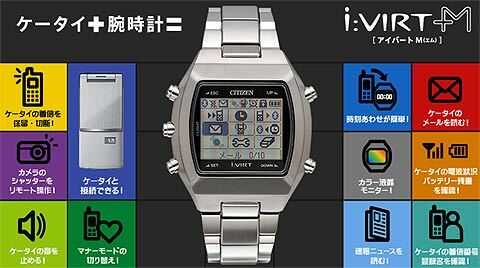 SoftBank Mobile is promoting this iVIRT-M watch, made by Citizen, as an added bonus feature to accompy their 920SH handset by Sharp. According to the details provided it “connects via Bluetooth, so incoming calls, mail, and S! Quick News will always be right at hand”.. we’re not sure if the pun was intended. In addition to functioning as a remote camera shutter, it features a 64-color LCD and can even display mail pictographs. It’s not clear whether the Citizen unit can also function with Sharps 920YK device, recently introduced with a bundled E*Trade stock market application. Stock Trading Key enables one-click trading application launch. Compatible with number-one online stock trading site, E*Trade. Make trades directly from the handset, which is setup for a special portfolio view just like a PC. Get updates and the latest news in real time so that you don’t miss a beat, even when looking at a specific stock. Unique to 920SH YK, after-market and night trading are possible. This handset comes in any color you like so long as it’s black..